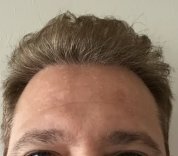 Failed FUE Bosley, Dr.Epstein, Dr.Wong - Thoughts? I agree, eyebrows aren't supposed to be noticeable. I should have left them alone after my first procedure with Dr. Epstein. However, the scars from the second procedure with Dr. Epstein really make my eyebrows stand out - in a bad way. If I can somehow restore my skin to the way it was, I'm fine with having what I have. Or if I can have hair cover my skin to hide the scars. Ideally, I'd like both. However, I'm willing to settle for either or. But, I can't keep them the way they are. Hello everyone, I’ve been a lurker on this forum for two years and I’ve now summed up the courage to share my story. I was diagnosed with Alopecia Areata when I was ten years old. I started noticing significant hair loss all over my body at the age of 16 and by 18, I had no hair anywhere on my body except my head. The hair that I do have on my head now is fairly thin with three patches on the back of my head and one patch on the left side as well as another patch on the right side of my head. But, what really bothered me at 18 was the loss of my eyebrows. When I saw my eyebrows disappear I was devastated. So, instead of feeling down about it, I was determined to get them back and since the age of 18, I’ve had a total of four eyebrow transplants. Before moving forward, I’d like to add that at the age of 18, I enlisted in the U.S. Marines and this, may have negatively played a role in my recovery. My first eyebrow transplant was done by Bosley in NYC and this was the only FUT procedure I’ve had. The results were subpar to be extremely generous. They transplanted many 2s and 3s when they should have strictly implanted 1s only. The shape and design of both brows were way off. The hairs implanted either grew vertically or in the wrong direction. Some grew in the correct direction, but, not many. Further, my yield wasn’t high, even the doctor agreed and thus both brows were very sparse and spaced apart. A year later, I was sad but kind of happy because it gave me a sense of hope since “progress” was made. (I was borderline delusional back then.) For my second procedure, I decided to go with Dr. Epstein down in Miami, Florida. This time I had the FUE method done with 250 grafts per brow transplanted. When I arrived there on the day of my procedure, I had a chance to meet Ed Syring, the gentleman who scheduled me for the procedure. I had a chance to sit down with Dr. Epstein for about 15 minutes, which was great because before moving on to the procedure we were both on the same page as to what was going to happen, how many grafts were going to be transplanted, the design/shape of the eyebrows, the density… etc. I was thrilled! From what I remember there were three technicians in the procedure room, all were super nice. And the last thing I remember before I was sedated was one of the techs saying, “Don’t worry, everything will turn out great.” When I woke up, the techs cleaned me up and I was taken to another room to be debriefed as well as given instructions for post-op care. Dr. Epstein stopped by to make sure everything came along according to plan, went over the post-op care procedures with me and then set me on my way. A year later, my yield was truly great compared to Bosley’s results – no delusion this time. The brows were shaped almost evenly, but I did not care because they were close enough. And, I had hair! There were two small areas that needed filling on both brows because there weren’t any grafts growing there. I spoke to Ed Syring about this and he spoke to Dr. Epstein and we both agreed on a touch-up procedure (touch-up procedure was scheduled 1.5 years after the first procedure with Dr. Epstein and 3 years after my procedure with Bosley). I was more than willing, especially since the first procedure went well. For my third procedure, I arrived 15 minutes earlier than I was supposed to and the waiting area was PACKED! There was a lady standing just outside the main door because there wasn’t any room in their waiting area. I made my way through to let the front desk know that I had arrived for my procedure. After waiting 45 minutes, I was let in to Dr. Epstein’s office and soon after, Dr. Epstein came in, asked how I was doing while looking at my brows and said, “same game plan, yes?” I said, “yes sir,” and I made my way to the procedure room. The meeting with him was superfast. The clinic was definitely busy that day, everyone was operating at a much faster pace. This time in the procedure room there were four technicians and I did not know if they were all working on me or what was going on but two of them were coming and going. They were speaking loudly to each other, almost aggressively as if they were in a feud. I could not tell as they were speaking in Spanish. I was sat down and made comfortable in the operating chair, the technician smiled and said “Don’t worry sweetie,” and that’s all I remember before being sedated again. When I woke up, I was taken to another room to be briefed and I was, but, Dr. Epstein never came to check up on me and I was told Ed Syring wasn’t in that day. I didn’t think much of it and on my way out, I asked the front desk where Dr. Epstein was and the lady said he stepped out a while ago and he should be back soon. I had literally just gotten up from the procedure and was still coming in and out of consciousness and I just wanted to get back to my hotel room to rest. So, that’s what I did. One month after my procedure, I had noticed almost all of my eyebrow grafts had fallen out, even the previous ones. I was told that this is expected, even though, I noticed the skin on both of my brows were significantly raised. At four months, still not much and my skin was slightly elevated than before on month one. At eight months, I still had no growth! Not only did I have no growth, the growth I had from my previous procedure wasn’t growing anymore and my skin was really irritated. So, I went to go see a dermatologist that specialized in hair loss and I was told, I experienced massive shock-loss and now had significant scarring on both brows. My eyebrows look 10x worse than my Bosley procedure. I now had almost no hair on both brows and even worse the recipient areas were raised due to scarring and had this red/pink shiny tint to them. I was able to get in touch with Dr. Epstein and when he looked at me all he said was “I’m sorry.” I was pissed beyond belief! I did not want another procedure or my money back. I honestly felt defeated. I spent the following four years getting many cortisone and prp shots to both recipient sites which drastically reduced the elevation caused by scarring. In 2015, I was still bothered that my recipient site looked and felt the way they did. I got myself together and kept researching and scheduled a procedure with Dr. Wong from Hasson & Wong in Vancouver. I felt and still do that if anyone can fix this, it’s one of the best hair transplant surgeons in the world. And so, on December 23rd 2016, I went in for my fourth eyebrow transplant and it was such a great experience! I was their last procedure for 2016. After all the paperwork was filled out, I met with Dr. Wong and the two techs that would be working on me. All three looked at my recipient and donor sites together to come up with the best game-plan moving forward. We all discussed how challenging my case was because of my previous procedures and the scars on the recipient sites. None the less, Dr. Wong and his techs assured me they would do the best that they could to fix my situation. His team is truly phenomenal! There were only two techs in the procedure room and I was not sedated, I was given anesthesia to numb the pain. I was fully able to carry a conversation with anyone at any point during the procedure. The two techs that were working on me were LASER FOCUSED, I was so impressed. There was a moment when Dr. Wong determined that I needed extra grafts and that it would cost extra. However, I had made the trip on an extremely tight budget and one of the techs sensed that without me even mentioning it. She spoke to Dr. Wong and he decided to waive the cost. I was so grateful to him and his team for that. When the procedure was done, I was so impressed by how many grafts they were able to transplant so close together. It was unbelievable. My entire experience with them from start to finish were beyond my expectations. (I was purposely vague with my experience with Hasson & Wong because this post is already lengthy.) Fast forward one year to present day and my results are unfortunately not where I would like them to be. I’ve attached pictures below. I’m scheduled to see Dr. Wong for a follow-up procedure on Jan. 4, 2018 to discuss my case further. I really believe I did not achieve the desired outcome not because of Dr. Wong but because of either or a combination of the below: 1. Scarring 2. Active Alopecia 3. PTSD (was diagnosed in 2015 and think this may have a role in yield) 4. My hair is REALLY coarse and this may play a role, though, I'm not certain. Since my first procedure with Dr. Wong, I did have 4 prp sessions this past year hoping it would help my yield. At the 7-8 month mark, everything was growing beautifully and then during month 9-10 many transplanted hairs would easily fall out and shed. And those hairs don’t appear to be growing anymore. L So, the reason for my post is to gather ideas on how I can stay on top of my graft health this time around. What can I do to further ensure higher yield? Any and all suggestions are greatly appreciated. Should I keep doing prp every 3-4 months after this procedure? Should I start taking Finasteride? I do plan on taking Biotin daily. Last, I promise I’ll keep a much more detailed account of my experience with Dr. Wong this time around. Thanks for reading and making it to the end.